A clear line has been drawn at the corporate-friendly trade deal during this year's convention. Philadelphia—When President Obama looked out across a packed hall at the Democratic National Convention Wednesday night, he could not have missed the large square signs opposing the Trans-Pacific Partnership. They could be seen throughout the sprawling arena. 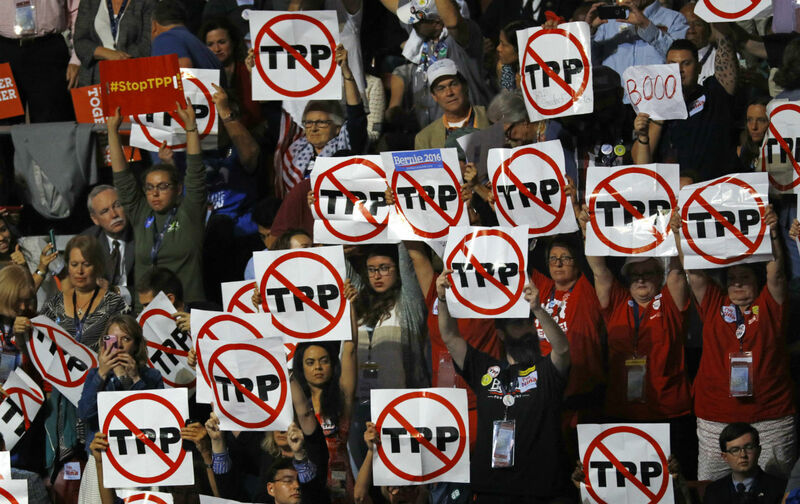 In the Texas delegation and the Oregon delegation, in the Washington delegation and the Wisconsin delegation, delegates waved signs showing the letters “TPP” circled and with a red line slashed through them. Mid-way through the president’s well-received address to the convention, delegates in a stand directly opposite the stage unfurled a sign that read: “TPP Kills Democracy.” And right up front, wearing his “Stop TPP” T-shirt, stickers and pins, was retired lawyer Stephen Spitz from Falls Church, Virginia. “I wanted to make sure that he saw that Democrats do not want him to submit the TPP in the lame-duck session of Congress after the election,” said Spitz, the “End Corporate Rule” coordinator for the group Progressive Democrats of America. Many of the people holding up the anti-TPP signs cheered when the president spoke of addressing inequality and injustice. Some attached their various anti-TPP signs—many of them produced by the National Nurses United union—to blue-and-white signs that read “Obama,” which were distributed by party officials and filled the hall for the president’s address. The TPP is where the line has been drawn at this convention. But there is still speculation that President Obama will seek to gain congressional approval in a lame-duck session following the election. Former secretary of state Hillary Clinton, who once suggested that the TPP could serve as a “gold standard” for future trade deals, became increasingly vocal in expressing opposition as the 2016 campaign progressed. “I oppose the TPP agreement—and that means before and after the election,” Clinton wrote in response to an Oregon Fair Trade coalition survey that was released in May. Delegates on the floor of the convention pressed the point. “The Democratic Party’s message has to be ‘No TPP’ and there can’t be any mixed signals, there can’t be a sense that it will suddenly reappear after the election,” says former National Association for the Advancement of Colored People president Ben Jealous, a prominent Sanders supporter who has now endorsed Clinton.